It is clear that where Roxham Road in Champlain, NY meets Quebec, our laws are not being enforced, our generosity is being abused and our border is wide open to anyone who wants to walk in and avail themselves of the friendly assistance of the Royal Canadian Mounted Bellhop Police. It is also obvious that the offending migrants knew the drill coming in.. They knew that if they crossed the border in defiance of explicit do-not-enter signs, they would be arrested and detained, but by mere virtue of declaring refugee status on Canadian soil, they would also be given a hearing, something that under the terms of the Safe Third Country agreement, they wouldn’t get had they chosen an official port of entry. Last year, most Roxham Road refugee claimants were Haitian residents who feared deportation after the protected status they enjoyed in the United States following the 2010 earthquake expired. But this year, most were Nigerians who had been granted a visa to enter the United States with the dishonest intention of using it to travel to an unguarded section of the Canadian border. For them, the United States was just a transit point, a stepping stone to the hospitable welfare state to the north. •	The RCMP intercepted 1,890 illegal border crossers in the first three months of 2017. In the same period this year (2018), that number soared to 5,052, compared to the 4,475 people who filed claims at legal ports of entry. •	Since the beginning of 2017, more asylum-seekers have crossed the border than the 25,000 Syrian refugees who were accepted in 2016. There were 18,644 refugee claimants in the queue at the start of 2017, but as of the end of March this year, there some 48,974---more than a doubling in 15 months. •	Understandably, this has placed an unsustainable strain on the refugee system. When Canada rejects an immigrant, the decision is final. For refugee claimants in Canada, however, rejections are subject to lengthy appeals, removal orders, and in some cases, Canada-wide-arrest warrants. Since the Immigration and Refugee Board can only process 1,000 to 2,000 claims per month, they can’t keep pace with the flood. In March, the board was able to complete a record 2,587 claims, but 4,078 new refugee claims came through in the same month. The backlog is out of control. •	As the backlog grows, it is taking longer and longer to process claims. Last October the wait time was 16 months. If border crossings continue at the current rate, the wait time could be 11 years by 2021. Thus, a 19 year old illegal border crosser could be a 30 year old father with three kids in Canada by the time his case was heard. Time enough to put down roots that would be very hard to pull up. These delays will amount to de-facto amnesty, and serve as incentive for more potential claimants to make an illegal crossing. Not to worry. The Trudeau government has injected an extra $173 million on processing illegal immigration. But speeding up “processing” does not add up to border security. •	96% of asylum-seekers have come via Quebec, which operates only four shelters for asylum-seekers, 1,850 spots in total. In Toronto in 2016, asylum-seekers accounted for 11.2% of the people using shelters. Today that number stands at 37%. The Mayor estimates that at current arrival rates the city will be housing 4,485 asylum seekers by November, occupying 53% of shelter beds when the system is already in an emergency state. Quebec and the City of Toronto are crying “uncle”. Quebec is demanding that federal government fork over $146 million, while Toronto is calling for $64.5 million. •	Each asylum seeker costs federal taxpayers between $10,000 and 20,000 per year in entitlements. In addition to the housing, social welfare, education and health care which they gain access to, under the Interim Federal Health Program asylum seekers are covered by dental and pharmaceutical care that provincial health care plans do not provide for Canadians. This in a country where “hallway medicine” and long surgery wait times are a fact of life in all jurisdictions. •	Both RCMP and Canadian Border Security Agency officials have been muzzled by the Trudeau government, and explicitly told not to speak to the media about the shocking surge in illegal migration. Oddly, Trudeau supporters who reacted with righteous rage against Conservative Prime Minister Harper’s muzzling of scientists are strangely silent about this gag order. These facts and stats are by no means exhaustive, but I think you get the picture. We have a massive problem, and the Trudeau government shows no signs of solving it. Some cynics would argue that they have no intention of doing so. But that is not the case. Liberals are getting nervous, and even Trudeau has been moved to back pedal. There is now an understanding that the government risks alienating Liberal voters who couple their naivety about welcoming migrants with a sincere belief that there have to be rules and these rules must be preserved and respected. It’s all about optics and partisan positioning. Liberal strategists are playing catch-up, as they try to shift to the right to adjust to the changing public mood and thwart the Conservative surge registered by recent polls. The outrageous spectacle of brazen law-breaking at the border is highly combustible fuel for a popular rebellion, which so far only manifests itself in relatively modest demonstrations at Roxham Road and the angry, bitter comments that follow pro-immigration online newspaper articles. One senses that there is a subterranean rage out there in search of a leader. Therein lies the danger for nationalists. So desperate is our need for a parliamentary voice that we are prone to vest unwarranted hope in the proven liars and opportunists of establishment parties, determined to ignore their past betrayals and globalist inclinations. "Turnbull understands the necessity of tough border protection…. a firm and controlled process of entry selection acts as a declaration that the nation state is in charge of its destiny. Tough border protection boosts public confidence in a non-discriminatory migration program, which includes an orderly, humanitarian refugee intake. It benefits immigrants and asylum seekers who go to a nation fairly and legally. It helps avoid the kind of chaos that lax border controls deliver. And it helps dampen down anti-immigrant prejudice." Smart Conservatives like Howard, Turnbull and Rempel make a clever calculation. 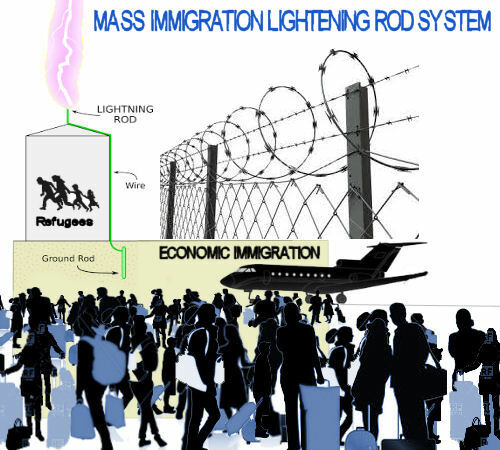 If they fan the flames of public outrage against asylum-seekers---whose numbers are but a fraction of our total migrant intake---they can turn the illegal border crossings into a lightening rod, and thereby decoy the angry mob away from what is most important: continual hyper immigration. Refugee-bashing is a small price to pay to ensure that the real invasion continues on an epic scale. Burka bans and references to “barbaric practices” and unwillingness to “integrate” serve the same purpose: Make mass immigration palatable by pretending that everything will be hunky-dory if only migrants check their tribal values at the door and embrace ours. Population overshoot is fine if everyone is “assimilated” and English signage can co-exist with Chinese. As is the case with Australia, the number of refugee claimants who enter Canada is peanuts compared to our annual immigration intake. So far, in 2018, the number of asylum-seekers who walk across our southern borders each day is but 10% of the number who stream through our airports. If, as informed sources fear, 400 illegals will be coming across the border every day during the summer, this would still constitute less than half the number of migrants than come through legally at official ports of entry. If reporter Faith Goldy’s worst case scenario of 219,000 illegal border crossers came to pass, it would still constitute only half of the roughly 400,000 immigrants and ‘temporary’ visa holders who arrive here legally. Perspective people. Put things into perspective. We are running out of time. Our window of opportunity is closing. Changing demographics promise to erode our cultural and natural heritage beyond recovery if we don’t soon mount strong political opposition. Unabated mass immigration will bury us. If we are to see an abrupt uprising against the government's bipartisan immigration agenda, we should hope that Canadians see the images of not 400 but 4000 Nigerians and Somalis streaming through Roxham Road each day. We should hope that TV viewers will be seized by panic, not by relative complacency--- as is the case now---- notwithstanding the still token number of brave, patriotic demonstrators that make their way to the border. The very worst thing that could happen, at this point, would be for the Liberal government to yield to Rempel's crusade and do as she demands. Declare the entire border as an official port of entry. We shouldn't want the Liberal government to get a handle on things. We should pray that they completely loose the handle, as they show signs of doing. In our desperation to look for champions, I fear that many of us are following her banner with the same enthusiasm that we rallied behind Conservative Party leadership candidate Kellie Leitch. We don't want to face the fact that these people have a different end game than ours. They want to re-capture office. That's it. And to do that, they will even throw some of their own under the bus just to get the liberal media hounds off their tail. Lynn Belak a case in point. To Canadian nationalists I say this. Beware of the Pied Pipers of Fake Populism. Beware of tough talking Conservatives who mask their globalist goals with the rhetoric of patriotism. Take in the big picture. And make them understand that we don’t really have a border crisis as much as we have an immigration crisis. Tell them that ‘fixing’ illegal immigration doesn’t cut it. Tell them that if they won’t commit to substantial immigration reduction, we will not commit to them. "........astute conservative politicians like Australia's Malcom Turnbull and John Howard.." (The correct quote is "Smart Conservatives like Howard, Turnbull and Rempel make a clever calculation" - Ed) Call the firies I think we're in trouble. The latter embraced neoliberlism with a vengeance and ran with it plunging Australia into a morass of greed and self-adulation only Menzies could have dreamed of. The former is a spineless fizgig trying to emulate the latter. Migrants are migrants whether they be refugees or otherwise. Migrants come in all shapes and sizes, some come through the front door some through the back. Some have beards and no hair, blue eyes or brown, African, Asian it doesn't matter, they are migrants The only thing that Oz has in its favour over Canada is, in Australia, migrants can't walk here! You speak of the differences between Liberals and Conservatives which is tantamount to being the same as they are both/all neoliberal, it's just the flavour that is different. They both/all have the same ideals and immigration is high on their list. Immigration in Canada like Australia produces economic growth one of the bedrocks of neoliberlasim. Economic rationalists crow loud and long when the GDP figures come out in their favour, just ask SlowMo!! However, there is a catch that these economic rationalists don't and won't talk about. Every migrant that enters your country costs the taxpayer money. While each migrant may increase GDP and while they may bring skills to the table, infrastructure must be provided to them by the state. If that infrastructure construct cannot keep pace with the rate of immigration then we can expect rising house prices, queues to access health and education facilities, rising pollution and environmental degradation. The same position that Australia is in and, by the sounds of it, Canada is facing. John Bentley wrote, "The worst part it is that a change of government won't change the situation ..."
At least we have an opportunity at election time to point this out to electors at election time. If there is no good candidate independent or small party candidate standing, then why stand yourself as I did in the 2009 Queensland election of 21 March 2009? I stood in order to force all the candidates to debate privatisation and population growth. Labor Premier Anna Bligh dodged questions I put to her about whether she intended to privatise assets belonging to the people of Queensland. Shortly after the election Premier Anna Bligh suddenly 'discovered' that she could only possibly balance the budget by flogging off much of Queensland's infrastructure. This caused a huge amount of public uproar. In the subsequent 2012 state election, Anna Bligh's government lost 42 seats and had only 11 members left in the state parliament. Whilst I did not get a high vote in the 2009 elections I almost certainly would have got a much higher vote in the 2012 election had I not been disabled by a traffic accident in May 2010. If all the people in your electorate, who are as fed up as you are with the major parties, got together, then there is every reason to expect that you could organise an effective campaign and, at least get a substantial vote, if not beat both major party candidates and win. I agree with your sentiments James, I have been voting for independents and minor parties for many years (I live in a blue ribbon conservative area otherwise known as the bush) for many years. I admire their resolve and resourcefulness in standing, however, I fear the electorate is yet to realise that they are being conned by the majors and so the status quo prevails. It won't be until the electorate is removed from their comfort zone, that they will start looking for an alternative to that.